A fundamental aspect of the syntax of any language is whether and where syntactic dependency between clauses and syntactic subordination is present. This is so, since not every natural language displays all types of sentential subordination. 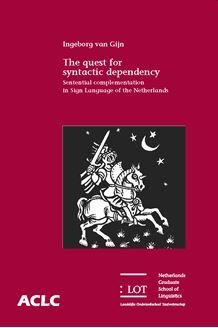 The present study gives a descriptive and linguistic analysis of one type of syntactically dependent construction in Sign Language of the Netherlands. In this study it is shown that potential complement clauses of various classes of complement-taking predicates are in fact syntactically embedded, although they lack a specialised marking for syntactic subordination. Furthermore, it is shown for most classes of complement-taking predicates that the subordinate clause is indeed a complement clause, i.e. the clause saturates the argument structure of the complement-taking predicate. Several other syntactic aspects of the grammar of Sign Language of the Netherlands are discussed as well: pronominal right dislocation, non-manual negation, and wh-movement in wh-questions and topicalisation. This study is of interest to linguists studying the syntax of signed languages, as well as linguists with a general interest in syntax.